For today, I want to share some healthy breakfast ideas with you. Hope you like them. 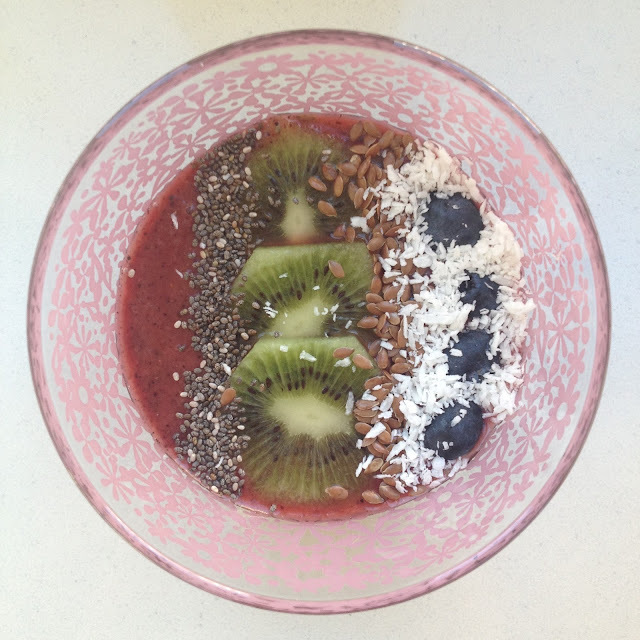 Spinach and hemp seed smoothie bowl: the base contains spinach, mango, kiwi & hemp seed powder; topped with pomegranate, kiwi, grapefruit, flaxseeds and chia seeds. Acai smoothie bowl: the base is made of blueberries, acai powder, grapefruit, mango, banana; topped with pomegranate, chia seeds, cocos flakes, flaxseeds & grapefruit. Acai smoothie bowl: the base is a blend of cheeries, kiwi, mango, acai powder; topped with chia seeds, kiwi, flaxseeds, cocos flakes & blueberries. This is my version of an inspired Italian BLT, but better? I used baby spinach instead of lettuce salad and prosciutto instead of bacon, toped with a poached egg and a grating of parmesan. It was very tasty and healthy. Spinach and mushrooms scrambled eggs with tomatoes, whole grain toast and green tea. Prosciutto and mini mozzarella on toasted bread. Wow, these look delicious! They're making me hungry, haha. Great post! So viele leckere Sachen, da bekomme ich ja gleich Hunger! I am into smoothie for breakfast normally, but the prosciutto with mozzarella really tempts me! Thanks for sharing these wonders! Great post dear! Healthy and cute! Everything looks so delicious, I'm so hungry now! Great post! Yummy! I will definitely try this out.